Recipes are like the pirates code, they're guidelines more than actual rules. Problem: I have a sister who, since her birth (I'm alleging adoption), refuses to eat anything with tomatoes in it. No ketchup, no red sauce, no pizza, and certainly not tomatoes themselves. Normally I would slow cook the meatballs in a home-made red sauce for about three hours or so. Unfortunately when I'm cooking at home the sauce method is not an option. One solution is to pan fry the meatballs in some olive oil, but they tend to dry out and become uninteresting. Solution: Inside each meatball I put a small cube of mozzarella cheese. 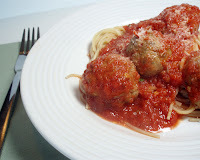 The melted cheese hydrates the rest of the meatball and makes it just amazingly delicious. In a large mixing bowl add ground beef, one egg, and the Bread crumbs. Mix together with clean hands adding bread crumbs until desired consistency is reached. Add to this the desired amount of spices, the various cheeses, and a splash of olive oil. Mix thuroughly. Cut the mozzarella into cubes roughly the size of standard gaming dice. Form into meatballs around a cube of cheese. Pan fry in olive oil on stove-top, turning occasionally. Alternately, allow to simmer in red sauce for 2-3 hours, stirring to avoid burning. Enjoy with pasta. Great leftover.